Have you’ve been ignoring that leaky pipe under your sink? Or better yet......have you arranged all of the buckets and bins in your house to catch the flying water? If this sounds like you, give the professionals at BRS Services a call to fix this minor plumbing issue for you. 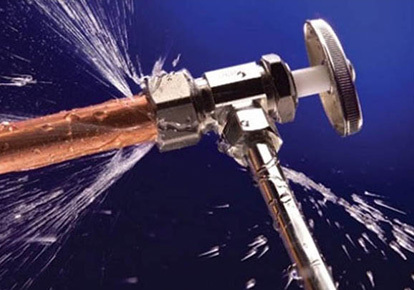 BRS Services provides the plumbers and craftsman to stop leaks. All of our plumbing work is performed by professionals who walk you through the process every step of the way for a simple and seamless experience. We may be able to fix the leak right when we arrive and hopefully it's just something simple like a coupling needs to be tightened. If a more extensive fix is in store, we can shut off your water, find the root of the leak and end it. Our goal is your complete satisfaction. If you need help with pipes leaking, give us a call today! BRS Services is your local Anchorage handyman serving area customers with complete knowledge and expertise. We have built our reputation by providing a high quality services at competitive prices on all of our projects. We are a full service handyman contractor with the tools and equipment to get the job done right. No job is too small! BRS Services is committed to providing our clients with the finest quality handyman services with professionalism and attention to detail. We take care of each customer’s needs from start to finish and are available around the clock to answer any questions you may have or clarify anything about your project. In short, we are always there for you. When you’re living in Anchorage, Alaska, trust your handyman needs to the experienced professionals at BRS Services. BRS Services is all about top quality service, great craftsmanship and an overall enjoyable experience for our clients. We are locally owned and operated and highly skilled in all aspects of home repair and maintenance. When you need a handyman to take care of that ever growing to-do list, BRS Services is here to serve you. Reliability – Our company offers year round services for our Anchorage area clients. Flexibility – Fully compliant with your billing procedures and with your needed repairs and services. Specialized Service – BRS Services has been doing handyman services in Anchorage for years, and in that time we have specialized our service to give great care to our work while providing top notch customer service. Locally Owned - and proud of it! We live in Anchorage and take pride in the work we do for all the local residents and companies we serve.